Orenburg shawls are of three types: simple shawl, shawl and tippet. Simple scarf knitted from a thick gray or white fluff is an everyday shawl. Gossamer fit out of thin down and silk. The pattern is complex and the tenderness and delicacy of the shawl is that the finished product is held in the engagement ring. Tippet is a large downy shawl-shawl. Wear it on festive occasions. Knitting Orenburg downy shawls does not cause difficulty for knitters with experience. If you can dial a loop, knit the front, purl the loop, to do and to pull nakida, you will be able to master the art of knitting Orenburg downy shawls. First of all, buy 200-250 g of prepared thin down the thread. Usually it is sold already napryazhenii on cotton thread. Carefully read the description of the knitting of shawl on the final scheme. A scarf knitted with border on four sides. Be careful and strictly follow the order of knitting. Start knitting from the edges of the lower left corner. The angle of the scarf consists of the right and left side. Knit both sides at the drawing, promazyvaya separation between "track" of the 2 front loops. Provatas full pattern border, move one part, the left top and one loop of the track, on the knitting pin the remaining border knit to desired length. Then vivacite bottom right corner of the border and put a pin on the upper right part of with one loop "track". Move the loop from one of the pins on the spokes and dial on the inner edge of the rim required a number of stitches for the main cloth of the handkerchief. Knit the fabric of a scarf with fringe on the sides to the desired size. Remove the hinge upper left corner of the border and leaf shawl pin. Vivacite the third corner of a scarf similar to the second corner, alternating nakida and promazyvaya together the right loop. Orenburg shawl is a symbol of Russia, we can say, its brand. The same as the matryoshka or samovar. Shawls in Orenburg have started to knit more of the XVIII century from wonderfully soft fluff Orenburg goats. Such a fluff is no longer anywhere in the world. Once the French were trying to breed themselves Orenburg goats and even brought a few individuals to France. But in a warm climate, these goats quickly turned into the "French women" with the usual rough wool. 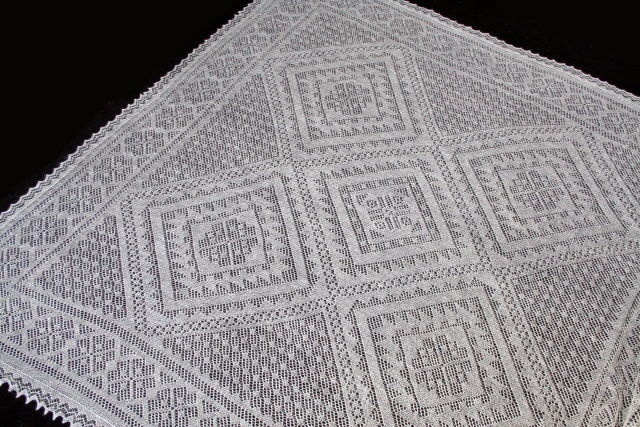 So unique Orenburg fluff is very appreciated all over the world, and Orenburg shawls are known far beyond Russia.